This weekend the kids and I went to visit my parents in the country. I love to go home for the weekend. It always helps me unwind and remember what’s important. It’s hard not to unwind in our little tiny town, it’s such a small little farm town that there’s not a lot going on. 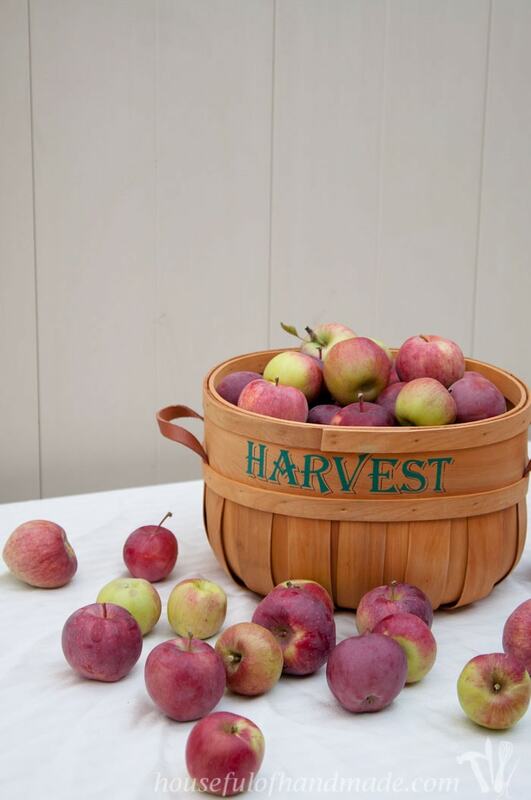 Sunday we spent the morning picking buckets and buckets of apples and pears. Now I have 6 five-gallon buckets of apples that need to be used up. When I was younger, I wanted so much to leave the country and live in the big city. Man, I wish I was as smart as I was now when I was younger! But in my defense, the population of our little town was about 700 when I moved off to college many years ago. Now (according to the 2013 US Census Bureau) the population has grown to a whopping 994! In addition to the little gas station where we would spend all our money on penny candies, there is now a German cafe and a Mexican restaurant with delicious homemade churros that’s only open on the weekend. Now, I would love to live in a beautiful little town and have an acre or two of land to have a large garden, some fruit tress, berry bushes and chickens. I guess you can take the girl out of the country, but you can’t take the country out of the girl! Now I am home, in the city, with tons of apples to be used up this week. I know I need to spend some time canning stuff for our pantry, but I also started thinking about all my favorite things to do with apples. 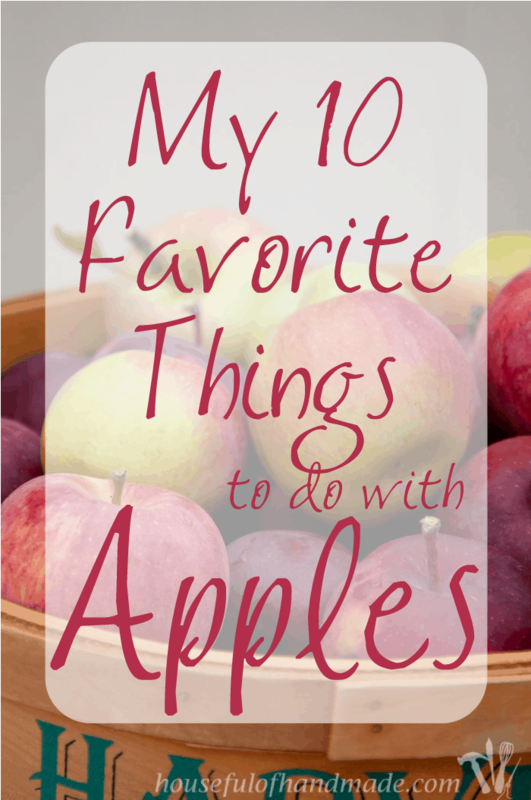 So I thought I would share my list of my 10 favorite things to do when I have tons of apples. Canning applesauce. I love to make my own applesauce because I can control everything. I never add sugar, it doesn’t need it, and I can leave the skins on so I don’t loose all that delicious fiber and nutrition. Also, it is a super easy recipe for learning how to can, I use this recipe from Ball. I use cans of applesauce year round in my cooking. You can throw it into tons of baking recipes, next to some beautiful pork chops, or just eat it with a spoon! Canning apple juice. I first made apple juice to can a couple years ago, and only because I was sick of canning and still had lots of apples to deal with. We don’t drink a lot of juice, but I always wanted apple juice for recipes or to give the kids when they were sick. Having shelf stable, homemade apple juice that was 100% apple juice with nothing added turned out to be super handy. Now I love having it on hand whenever I need it without having to run to the store. I also use it to make spiced cider during the holidays. Yum! Apple Butter. If you are not familiar with fruit butters, you need to try this immediately! Seriously, fruit butters are made with the whole fruit (including peels) and cooked down until it is a thick paste that is the fruit concentrated! They are full of flavor and don’t need as much sugar as jams and jellies, they also don’t need pectin. I love a slice of my favorite homemade bread with peanut butter and apple butter on it. And for an extra special treat, make caramel apple butter. 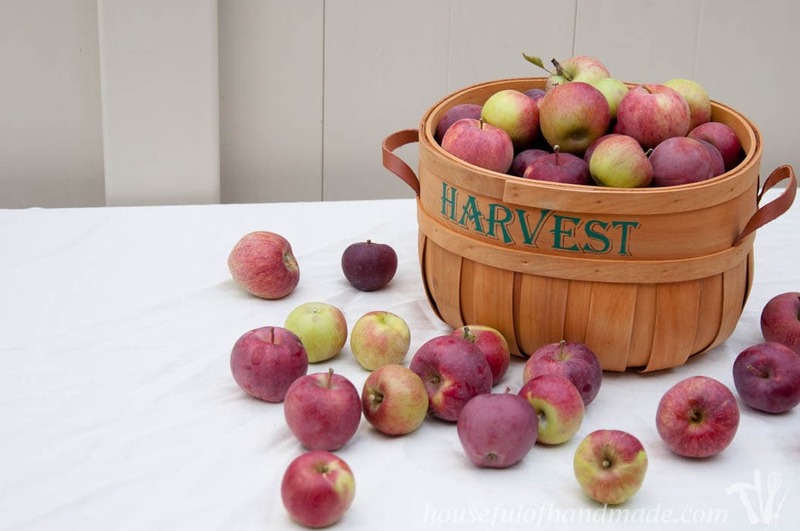 Apple butter can be made and stored in the fridge, or you can make large batches for canning. They are perfect for Christmas presents. Apple Crisp. One of my favorite easy fall deserts is apple crisp. It can be thrown together so quickly and tastes just like fall! Serve it warm with a scoop of ice cream or try this delicious recipe from A Savory Feast that uses mascarpone whipped cream. Apple Galette. Another fast fall desert is the galette. This is my hubby’s favorite desert for sure! A galette is similar to a pie, but the pie crust is free-formed around the fruit on a sheet pan so you have a little less fruit, which means more delicious flaky crust. And it it faster to put together than a traditional pie so it’s easier for me. I love this galette recipe from Remodelaholic, just use chopped apples and toss in some cinnamon with the fruit. Apple Cake. Who doesn’t love cake? And apples are just made for cake. They add moisture and flavor, and because they are naturally sweet and delicious, you can usually get away with less sugar or fat in your cake. So it might be a slightly healthier cake option, but still cake! I can’t wait to try this cake from the Plaid & Paisley kitchen. Doesn’t it look amazing? Caramel Apples. It isn’t fall without the perfect marriage of caramel and apples. I love to eat the traditional apple on a stick that’s covered in caramel, or just a creamy caramel to dip slices of apples in. Either way, caramel with apples means fall is here! Apple Pie Green Smoothie. I am trying to eat a green smoothie a day, mostly because I just really like them, but also because it’s an easy way to get in tons of veggies for breakfast. Making your green smoothie perfect for fall is easy, I don’t really like recipes for smoothies because I just toss things together then hit blend, but I use almond milk, spinach, 1/2 a banana, an apple, some cinnamon and vanilla extract. If you need more sticking power in your smoothie (which I like to use for my breakfast smoothie) toss in some rolled oats too. Blend until smooth and enjoy drinking a little bit of fall with your veggies. Apples & Dip. I love to serve a plate of cut up apples with a delicious dip as an afternoon snack or along side our dinner. My kids can never turn down an apple, but especially when served with dip. My 2 favorite dips for apples are this Pumpkin Peanut Butter Dip from A Night Owl and this Greek Yogurt Peanut Butter Dip from Family Fresh Meals. Just sinking my teeth into a crisp apple! Seriously, I just love biting into a crisp, delicious apple. It’s the best afternoon snack and I almost always have an apple in my purse for emergencies. Hot apple desserts are my thing, like apple crisp and apple pie. Would love to try some more of these, thanks for sharing the great ideas on Merry Monday! Thank you so much for the share! All these posts in your roundup are amazing! What a perfect list for fall! Not to mention, it’s making me hungry 😉 Thanks for linking up to The Creative Circle! Thanks Jen! I can’t be on Pinterest in the late afternoon, too many delicious ideas make me hungry too! Apple butter is the best! Thanks for sharing! As soon as Fall arrives, I just want to make apple everything! Apple butter is one I’ve been craving lately. I know, apple butter is so good! I can’t wait to get cooking with all these apples, I just have to wait cause I have a busy week this week (good thing apples last for a while). Absolutely love that you posted this!! While everyone else goes crazy for pumpkins I am sneaking all the apples! LOVE Apples! 😀 Thank you for sharing! 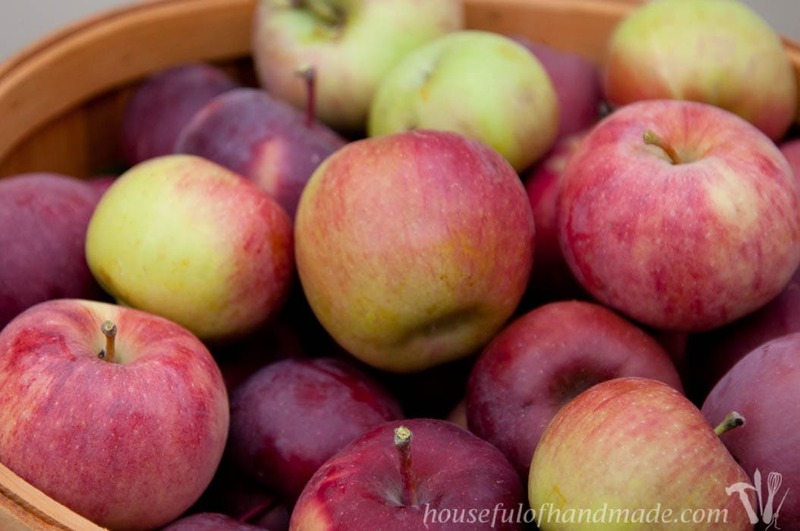 Apples are just as much fall as pumpkin! I do love pumpkin, but I have equal love for apples, especially in baking. Yum! 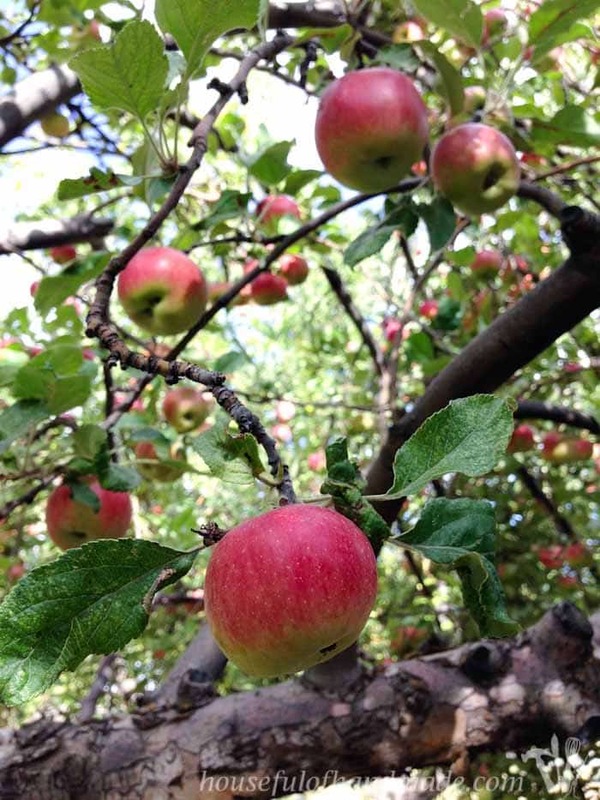 I was so sad that my apple trees did not produce any apples this year. Hopefully next year. I loved being able to freeze apples last year and use them all year long. YUm! Apples trees are weird, we usually only get apples every other year. How do you freeze apples? I’ve never heard of that. All great ideas! I love baking with apples! I’m a country girl also, that’s been taken out of the country. And I absolutely love apples too! In my hometown they have even an apple butter festival every fall. I’ve been dying to go pick some apples. I was wondering if you could share a recipe for the canned apple juice? Or, do you just juice the apples and seal the jars? Hello Gina! I want to go to an apple butter festival, that sounds delicious 🙂 When I can apple juice, I juice it in my juicer, then heat it to just below boiling and process in my waterbath canner for 10 minutes. Easy peasy!